Description: 21M rolls through Bound Brook making track speed. Description: NJT Cab Car 7016 leads a multilevel NJT set into Bound Brook with an ALP45dp powering the train. 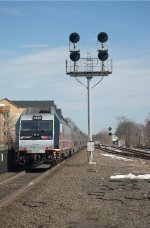 Description: 20W heads through Bound Brook on a warm day in March. Description: CSX Q702 passes the Bound Brook station on Ex LV rails. Description: Another GE leader. When will it end?!? Description: Heading through Bound Brook with 2 wide cab GEs and 1 standard cab GE. Description: NJT 4531 is powering the set departing Bound Brook for Newark, NJ. The AL45DP engines were being used for extended trial service on the RVL. Description: NS 22V heads through Bound Brook with a newer ES44AC leader. Description: Finally a standard cab EMD! Description: a CSX GEVO leads an UP SD70M & CSX SD50-2 8600 through Bound Brook, NJ. Description: Coming into Bound Brook Station. Description: NJT 4516 provides the power for a RVL train heading for Newark, NJ. Description: An RVL local pulls into Bound Brook Station. Description: The RVL local heads out with an NJT ALP45DP locomotive. Description: An NJT ALP45DP locomotive departs Bound Brook. The ALP45s were being used in extended test service to Newark, NJ. Description: Trash loads bound for an Ohio landfill head through Bound Brook, NJ led by two Dash 9s. Description: 212 heads through Bound Brook with 3 Dash 9s. Description: Shot one last NJT train before leaving Bound Brook after what I would consider a successful day.